Comm Eye Health Vol. 13 No. 34 2000 pp 22 - 23. Published online 01 June 2000. 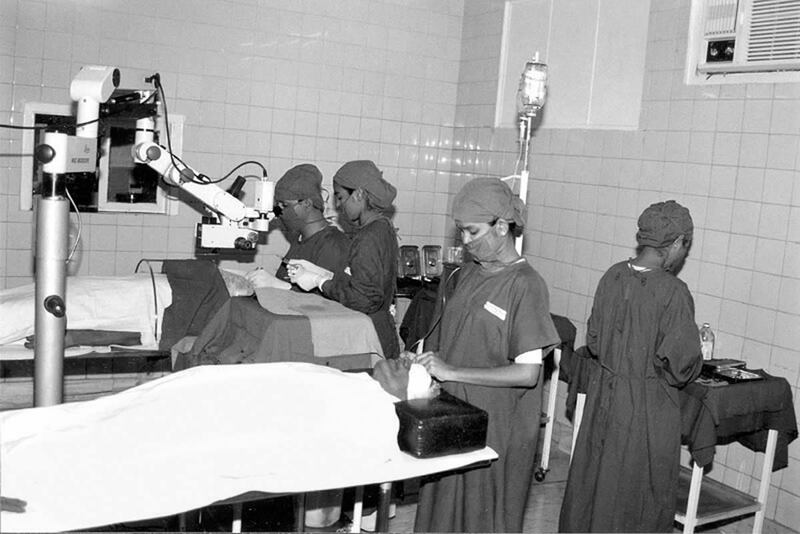 The increasing magnitude of blinding cataract means that the number of cataract operations is far below the level required to take care of the incidence and clear the backlog. As economic status and literacy levels improve the requirement for better vision will increase and people will demand cataract surgery earlier. The rapid growth in the older population, will further increase, by many times, the number of cataract operations that will need to be done. Even in India, which has a fairly high cataract surgical rate (CSR)1 of about 3250/million/ population/year, the rate will need to increase by two to three times to address this problem effectively. In many countries the desired CSR should be ten times the current levels. Increasing the uptake of cataract services is by itself a major challenge and equally challenging will be maintaining high quality in service delivery. This requires a combination of increasing resources (increasing the capacity) and maximising the use of available resources (increasing efficiency). This paper focuses on increasing the capacity and efficiency of the existing system of service delivery, which will be a genuine need in many situations. Working hours during which the hospital is open to register both outpatients and inpatients. Many hospitals have a limited time to register outpatients, often too early in the morning, for patients who have to travel some distance to the facility. Length of (inpatient) stay (LOS) is another determinant of how many patients can be accommodated. If the average LOS is 5 days then at 80% occupancy, about 60 patients can be admitted per bed per year. If occupancy can be brought down to 3 days through better co-ordination and improved surgical techniques, then 100 patients can be admitted per bed. In a 50-bedded unit this increases capacity by 2000/year. Once the patients are in the hospital and how well and how soon they receive care depends on internal efficiency. This can be thought of in terms of productivity, which is the relationship between input and output in a specified time period with a required quality. It is directly related to utilisation of resources (Table 1). Instruments & Equipment Diagnostic and surgical equipment. Instruments and their maintenance. Standardisation. The hospital should follow a standard surgical procedure. This is particularly important when there is more than one ophthalmologist. Better instrumentation, training of paramedical staff and patient flow, all contribute to increasing efficiency and quality of care. Standard surgical procedures must be periodically reviewed against outcomes, new technologies and new instrumentation. Division of labour. In diagnosis or treatment there are a number of clinical tasks. In many settings an ophthalmologist does the entire range of clinical tasks including routine ones which are often the most time consuming. With proper training, paramedical staff can perform many of the routine and also ‘specialised’ tasks – from the simple task of measuring visual acuity to the use of A-Scan or computerised field analysis. Similarly, in surgery, there are many preparatory steps that a nurse can do very well which can significantly increase the volume of work that an ophthalmologist can do. Care must be taken to match the tasks to be performed with the skills of the person, to ensure the desired quality standards and it must also be recognised that quality evolves continually, based on technological innovations and patient expectations. Micro-level planning. In addition to long range or annual planning it is essential to plan for the next day and ensure that all resources are organised and all concerned staff are informed. The form below (Illustration 1) with suitable modifications and more rows as required, could help in such planning. Operating room layout and work-flow. The OR layout, and workflow within it, has a maximum bearing on efficiency in terms of how many operations are done. The OR layout, for example, could have two tables with a floor model operating microscope between them (see Illustration 2). While the surgeon is operating on one table, the second assisting nurse can prepare the patient on the next table. Variations of this model are in practice elsewhere. For example, in a surgical practice in Germany, there is only one table on wheels with three other such tables, with patients on them, in an adjoining preparation room. When the surgery is completed, the patient is wheeled out and another patient wheeled in. The basic underlying principle is the same – cutting down on the surgeon’s waiting time between operations. Adapting newer technologies. The high volume of cataract surgical procedures world-wide has led to newer surgical methods, together with related instrumentation developed by the industry. The general direction is towards smaller surgical incisions requiring no sutures. Of the several options available, Manual Small Incision Cataract Surgery (MSICS) promises much in promoting higher productivity, reducing costs and improving the quality of outcome. Once mastered, with good organisation as described above, a surgeon using this technique can easily complete six cataract operations in an hour. Information and review systems: having a well-motivated team. A formal quality assurance system should be in place to monitor intra-operative complications, clinical outcomes, patient satisfaction and utilisation of resources. This should be discussed periodically with all the hospital staff – to get their inputs for improvement, resulting in a well functioning and motivated team which is essential for operating at high volume and quality. – Involving the hospital staff in policies and decision making, especially in areas where they will be responsible for implementation. There is an urgent need to move beyond the debate as to whether high quality can be achieved with high volume cataract surgery and actually develop and implement ways of meeting the need. Bad service will not attract patients. 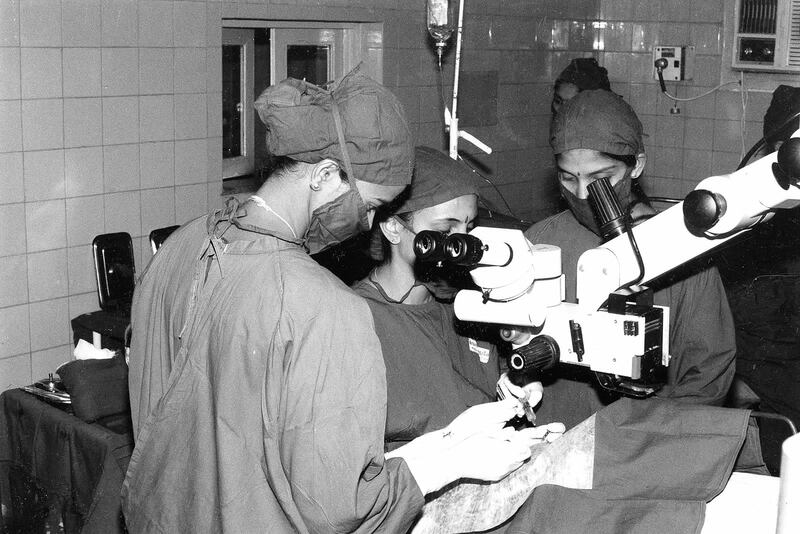 At the Aravind Eye Hospital in Tamilnadu, the strategies and methods described above have made it possible for 70 ophthalmologists in the Hospital to do more than 150,000 cataract operations a year, in addition to other surgery. In other high volume settings, such as in Lahan or Lumbini in Nepal, these principles can be seen translated into applied working systems suitable to the practice required. With proper systems and the right attitude in patient care it is possible to achieve these aims in all situations. 1 Global Initiative for the Elimination of Avoidable Blindness, 1997. WHO/PBL97.61. 2 Natchiar G, Robin A L, Thulasiraj R D. Attacking the Backlog of India’s Curable Blind – The Aravind Eye Hospital Model. Arch Ophthalmol, 1994; 112: 987-93. 3 Thulasiraj R D, Priya R, Saravanan S. High Volume, High Quality Cataract Surgery. Indian Journal of Community Health (IJCH), 1997; 3 (No.2): 32.